AX3701 is a high efficiency monolithic synchronous buck regulator using a constant frequency, current mode architecture. The device is available in an adjustable version. Supply current with no load is about 200uA and drops to <1uA in shutdown. The 2.5V to 7.5V input voltage range makes AX3701 ideally suited for single Li-Ion, two to four AA battery-powered applications. 100% duty cycle provides low dropout operation, extending battery life in portable systems. Pulse skipping mode operation provides very low output ripple voltage for noise sensitive applications. Switching frequency is internally set at 1.4MHz, allowing the use of small surface mount inductors and capacitors. 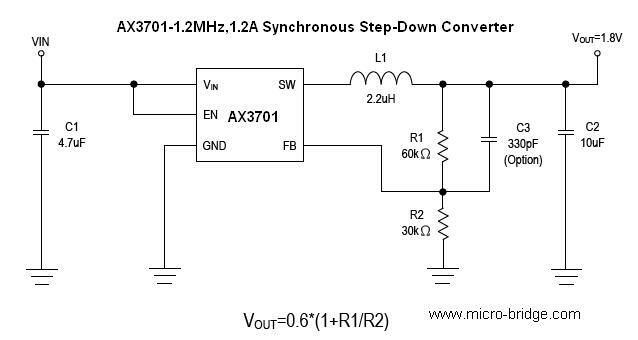 The internal synchronous switch increases efficiency and decreases need of an external Schottky diode. Low output voltages are easily supported with the 0.6V feedback reference voltage. AX3701 is available in small (T) SOTSOT -23 -5L, TDFN-6L (2*2) packages.